? ?Yes I am still in love with @sugarbearhair! Love how my hair looks and feels… #ad These amazing hair vitamins are DELICIOUS!!! #sugarbearhair ?? Except, what if we think about influence more holistically. Lee points out that you don’t have to be a Kardashian to be influential. From singing the praises of the battery life on your new iPhone8 or telling your coworker about the new software you’re testing in your department, we’re all influencing each other. This holistic view of influencer marketing, thinking beyond the brandividual, is what will help you drive ROI within your influencer marketing. Spoiler alert – Lee thinks you should be doing influencer marketing if you’re a B2B marketer. And a lot of you are. 43% of marketers are experimenting with B2B marketing. But we’re still in the early days. Only 11% of B2B companies are running ongoing programs, compared to 48% of B2C companies (Influence 2.0: Altimeter, Traackr, TopRank Marketing). So why are so many B2B marketers experimenting with influencer marketing? Largely, we believe that influencer marketing can help us with lead gen. 67% of marketers cited lead gen as a goal for influencer marketing. In fact, influencers can help us at each stage of the buying cycle, from awareness to purchase to advocacy. So even though we’re just getting started. You believe in the why, and are very optimistic. 57% of marketers say influencer marketing will be integrated in all marketing activities in the next 3 years (Influence 2.0: Altimeter, Traackr, TopRank Marketing). To achieve true integration, and keep our budgets and resources growing for more influencer marketing, we need to drive ROI from those programs. Lee shares several examples of B2B influencer campaigns generating major ROI. He highlights several opportunities to drive value for your brand and influencers. Simple Content: Influencer co-created content doesn’t have to be complicated. Find 10 influencers, ask them one question and compile and their responses in an asset with 90% influencer contributed content. Gating the asset with an easy to fill out form, can drive big results in terms of MQLs. Influencer Integrated Content: Influencer content can take multiple forms. In the previous example, it was 90% influencer created and gated. Influencer content can also be incorporated into an asset as seasoning, providing support or color for brand generated content. Repurposing Content for ROI: You can drive more ROI by getting the most out of your influencer content with repurposing. Once you’ve done all the work of getting influencer contributions, use the full contributions in a guide, include preview snippets in a blog post, round up some key ideas with stats into an infographic, or leverage important topics for an influencer webinar. Content repurposing not only helps you get more mileage out of your content, it will help drive additional amplification to your core assets, creating opportunity for ROI. Interactive Content: Interactive content is intrinsically more engaging. If the visitor has to act in order to consume the content, they are already activated to take the next steps to share, click or download. Magic sales expectations: This is an outdated perception that means treating influencer marketing like an ad buy, instead of an opportunity to create organic experiences. This works for B2C, but not for B2B. Lack of consensus on the strategy: To be successful, you must have agreement on who your influencers are and how you are leveraging them . If there is a disconnect between PR and marketing, it can dilute ROI and create a less than awesome experience for your influencers. Lack of resources to commit: Influencer marketing isn’t something you want to throw an intern at. You need people and resources that can perform at a very high level. Disregard for FTC compliance: Enough said. Unable to measure inputs, outputs and performance: In order to show value and continue to grow budgets, you must be prepared to report on the results. What will it cost you if you don’t secure relationships with the top influencers in your industry and the competition does? What influencer engagement models should you start with? Planning ahead for these considerations, will ensure your team is starting your influencer program with appropriate goals to show ROI. We already know that influencer marketing doesn’t work when there is a lack of consensus on your influencer strategy. To truly maximize ROI, you should consider influencer programs across your organization. 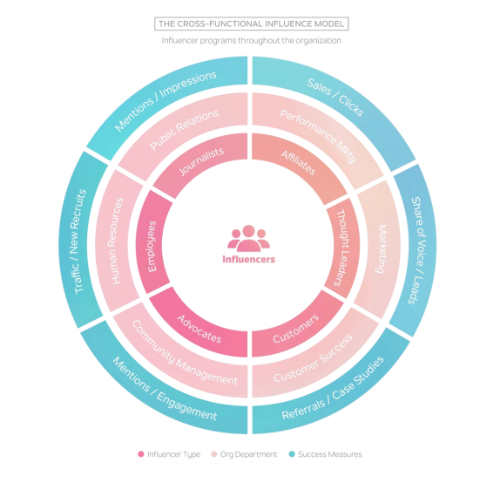 In a cross functional model you’ll be able to tap into all types of influencers, including journalists, affiliates and customers, illustrated in the model below. Regardless if you are just starting to experiment with influencer marketing or you already have an ongoing program, there is an opportunity to take it to the next level. 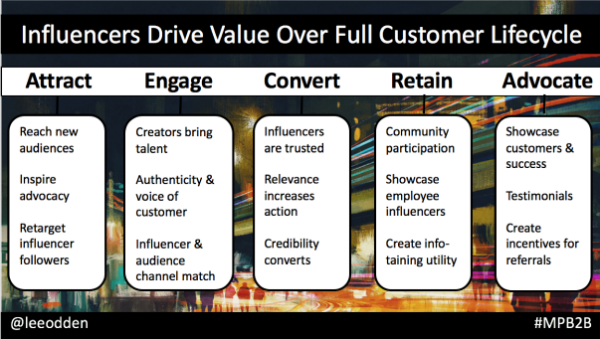 Think about where you might fit into the spectrum of influencer marketing maturity progression Lee shared. Accelerate your influencer marketing efforts by activating your existing community and focusing efforts on what works best. What is one way you are planning to take your influencer marketing to the next level this year? If you have lot of great influencer content already, drive more engagement with these tips from Ardath Albee The Netflix Experience: Create Binge-Worthy B2B Content. The post Why to ROI: Proving the Value of B2B Influencer Marketing with Lee Odden appeared first on Online Marketing Blog – TopRank®.